If you have a smartphone or tablet with a microSD slot and have been itching for a deal on a 512GB card, this could be the day you finally pull the trigger. 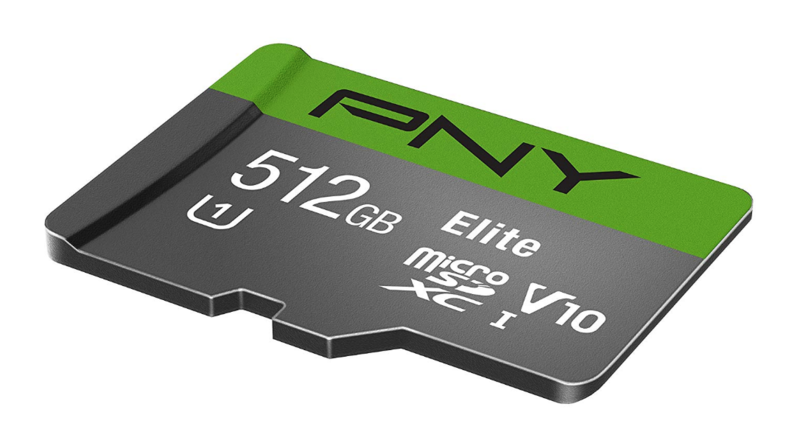 The PNY Elite 512GB microSD card, which was introduced in June at $349.99, is down to an all-time low price of $149.99 (that's $200 off) on Amazon today only. This beats the pants off of the $239.99 deal we saw back in December. The PNY Elite 512GB complies with Class 10/U1/V10 standards, which means it has a minimum sequential write speed of 10MB/s, though the card maker notes that it can support maximum transfer speeds of up to 90MB/s. With 512GB of storage, this microSD card can hold up to 80 hours of full HD (1080p) video recordings or 100,000 photos at 18MP. Media storage and playback will work decently, but look for a higher-class card if you're thinking of running apps off it. Speaking of which, today's Amazon Deal of the Day also includes the PNY Pro Elite 512GB microSD card for $179.99, which is $100 off the usual price. This card, which was announced last month, complies with Class 10/U3/V30 standards, which means it has a minimum sequential write speed of 30MB/s. PNY says it can hit up to a 100MB/s read speed and a 90MB/s write speed. It also has an A2 app performance class, which means it's capable of storing and running mobile apps decently enough. These are just two of today's Amazon deals on PNY products. Look at the full list to see discounts on USB 2.0 and 3.0 flash drives, a 240GB 2.5" SATA III internal SSD, and more. As of the time of publishing, there's less than 15 hours left before these deals expire, so act soon if you're interested.